NEET PG 2019 Result Declared. Check it here. The much-awaited result of NEET PG 2019 has finally been declared. Students were eagerly waiting for the result from the day they attempted the exam. 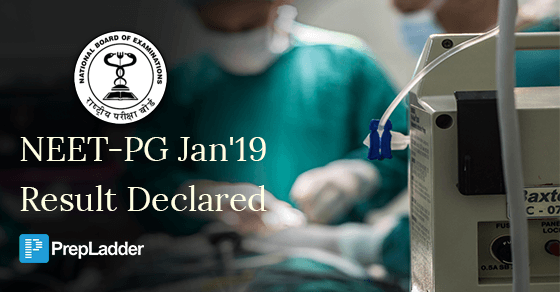 NEET PG 2019 was held on 6 January 2019 all over the country. When surveyed, many candidates who took the exam had reviewed it as Moderate-Difficult. The result has been declared in the form of PDF which contains roll number, score, and rank of the candidate. Click here to predict what specialty you can get in All India counseling according to 2018 counseling result. All the candidates scoring more than the cut-off marks will be considered QUALIFIED. In the event of two or more candidates obtaining same marks, the merit position shall be determined using following tie-breaker criteria in descending order. Candidates having lesser no. of negative responses in the whole paper (Part A + Part B + Part C) will be placed at a better merit position. Candidates obtaining higher marks in Part C of the question paper will be placed at better merit position. Candidates having lesser no. of negative responses in Part C of the question paper will be placed at a better merit position. Candidates having lesser no. of negative responses in Part B of the question paper will be placed at a better merit position. Candidates obtaining higher marks in Part A of the question paper will be placed in a better merit position. Older candidates will be placed in a better merit position. All those who could not qualify NEET-PG 2019, don’t get disheartened, gear up for upcoming exams. “Failure doesn’t mean the game is OVER, it means try again with Experience”.